Egypt's President Abdel-Fattah El-Sisi stressed on Tuesday to water and irrigation ministers from a number of Nile basin countries the importance of reaching a consensus on the 2010 Cooperative Framework Agreement, which aims to guarantee the rights and water security of all countries along the river. 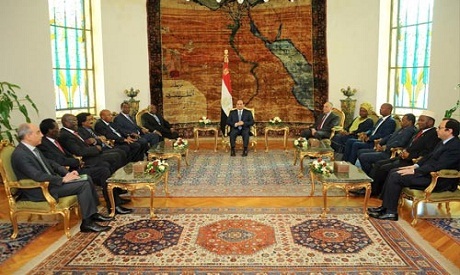 The Egyptian president held a meeting in Cairo with ministers from Sudan, South Sudan, Tanzania, Burundi and Uganda, who are participating in the National Water Research Centre's conference on water sustainability. During the meeting, El-Sisi reiterated Egypt’s policy of non-interference in the internal affairs or development plans of any country, highlighting the importance of boosting economic solidarity and cooperation to achieve development on the African continent. Uganda, Rwanda, Tanzania, Kenya, Burundi and Ethiopia have signed the agreement. Egypt and Sudan, however, have refused to sign the agreement in its current form, saying it would affect their historical shares of the river's water. The agreement, also known as the Entebbe agreement, is meant to replace a 1929 agreement that awarded Egypt and Sudan the majority use of the Nile River.